So, you have your photographer and theme sorted for your pre-wedding shoot, but the biggest problem is getting your venue sorted. Where do you shoot it? How much do you pay? What is allowed? If you’ve got such questions running through your head, don’t fret—WedMeGood’s got your back. They’re telling us their favourite venues in and around the city for that pre-wedding shoot you’ve been dreaming of. An English cottage set amidst large farm land, Tikli Bottom is a retreat located about an hour from the Gurgaon border. While getting there is a bit of a task, the location, with a swimming pool and open lawns, is beautiful. 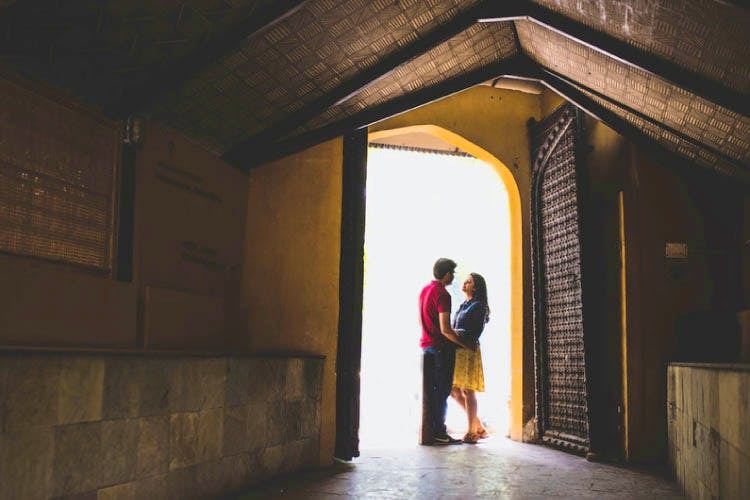 In the by-lanes of Lodhi Colony are a bunch of brightly painted, colourful walls that provide the perfect backdrop for a pre-wedding shoot that has a bit of character. The best part—since this is public property, it’s free for use. There are very few venues in the city that are more beautiful than the gorgeous The Roseate. From water bodies to stunning landscaped lawns and even minimalist sandstone architecture, there is something for every kind of couple here. It doesn’t come cheap though. If you’re on the lookout for some variety, The Perfect Location is quite perfect, actually. It has multiple backdrops you can choose from—pick from a Greece-like backdrop, an outdoor picnic spot, a horse ranch, and lots more. HKV is home to a host of things you could use—the lake, the fort, the deer park right behind it and the by-lanes that can give that busy, worn out vibe that looks great in photos. This may seem like an odd choice for a pre-wedding shoot venue, but we love how the team at The Creative Lens made use of the free location by incorporating vintage, minimalist elements for a shoot that looks like it has come straight out of a seventies movie. Check out a shoot done at Connaught Place here. Want a venue that’s larger than life? ITC Grand Bharat may be the answer. This is not easy on the pocket though, but the grandeur of the place is for couples who won’t settle for anything less than the absolute best. Don’t worry; we thought this was weird when we first heard this suggestion, but just one look at the railway tracks and the vintage Maharaja trains in the background, and it didn’t take us too long to fall in love with this setting. Situated in Manesar, reaching this place will take about an hour and a half from Gurgaon. This golf resort has lush landscapes and wide open spaces, which makes it perfect for video shoots as well. You can read WedMeGood’s original post here.